If you can keep the weight down to under 8 oz. the normal first class return shipping is about 15.00 from the USA to NZ. Jeff can tell you better about the combined cost. My last package to NZ which was about 2 lbs was 54.00. I normally send 20.00 myself to help with costs both ways. - I will need the cars minimum 2 weeks before the race. As we get closer I will set a definite date. - I ship everything First Class. The value is the big thing I have to watch. It has to be below $400 to avoid any taxes / tariffs. So depending on how many entries there are, I will split the shipment up. There is no insurance on First Class. Each box will cost me between $21 - $25. I have had to ship 3 separate boxes before. Priority shipping is double that. - Kiwidave will have the final say on the money end. Normally it is the same entry fee as any other race ($8). That will normally cover things on my end and I always try to pass the excess, if there is any, on to Kiwidave (if he will accept it). Like I said, Kiwidave will have the final say in how and what to do with money, but that is how we have done it in the past. I am more concerned about taking care of Dave. He does a lot to run the event....above and beyond. I volunteer to do this and try to make things easier for Kiwidave and to hopefully have more people enter knowing they dont have to deal with International shipping. I love the International races we do in N.Z. and I want to do all I can to see them continue. The cars are handled with the utmost care and are shipped in the boxes they are mailed to me in when possible. I just make sure they are packed well for the long haul. I recommend tight packing.....no movement within the box. Less blunt force trauma that way. 2nd race I ran.....boxed all cars up to send home and handled them all like glass. Put all the small boxes in a bigger box for transport to the post office. Less chance of dropping one that way. Took them in and carefully took each one out of the box and handed it to the USPS person. She did her thing and put each one on a shelf next to her. We finished and I paid the postage. As I was turning to walk away, I watched her pick them all up at once and dump them down a metal chute behind her. I heard them tumble all the way down and hit the bottom.....LMAO. You are at the mercy of the mail carrier.....many of them. Pack your cars tight and with adequate padding. Yes we are at the mercy of the shippers, most could care less. If you think that is bad we had our luggage left out in the rain at one of the airports and everything got soaked ruining a 300.00 leather cue case. It looked like the luggage was thrown into a puddle as it was thoroughly wet on the bottom and not on the top . This was done by Southwest airlines. Useless fools. Makes you think that their attitude must be pretty bad to do something like that, never flew with that airline again. Hi, I would like to take part. Please let me have postage details as my car is coming from England. Hi Mazda, best check with KiwiDave and send the cars direct to him. I imagine cost would be similar to sending the cars to the US. Will be glad to see you at the New Zealand race. Cars ready to go to the Kiwi race. 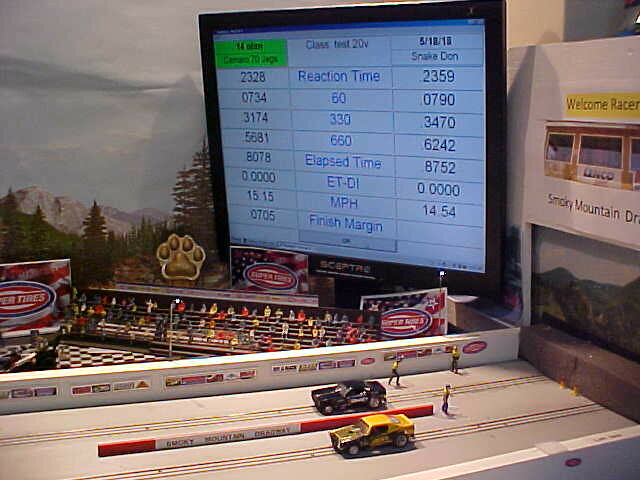 All seem to be running well, the AFX 14 ohm stock 57 Nomad and the 57 Vette are running side by side down the track as shown by the .0099 mov. 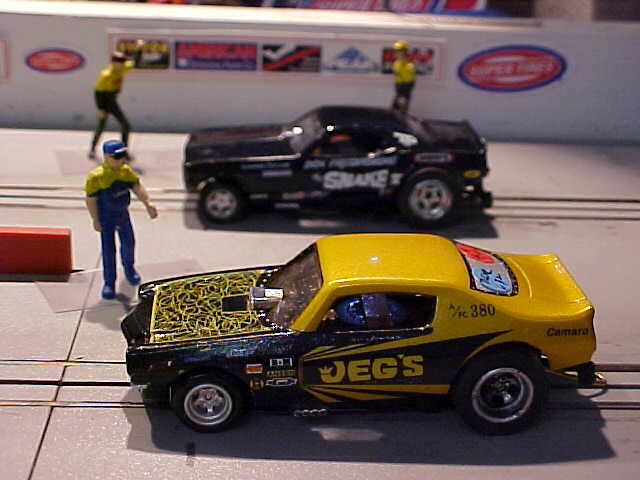 The Jegs car ran the fastest 4G stock 14 ohm time I ever ran on my track on this run at 20v. When I first started my cars could not pull a bum out of bed... A LOT of testing testing testing is what I did to find out what works and what don't, just like full size cars, theory is nice but putting it into actual practice is the answer. No big secrets at all just a lot of little things. 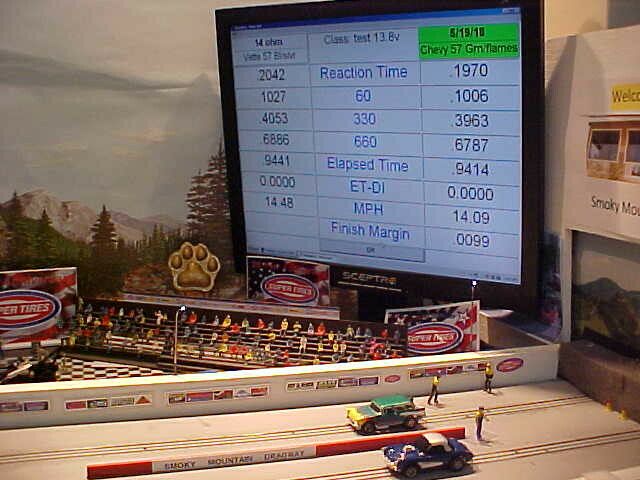 Also my cars may be as much as .02 slower on other tracks. 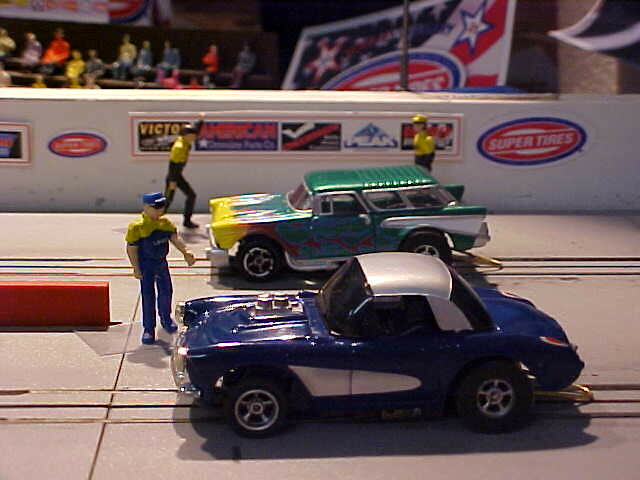 If I put my 60+ MPH cars on other tracks I bet they would not even hit 40 MPH. Yeah, same here, gnome. Still workin' on it and hopefully I'll do better than having the highest ET . I'm beginning to remember now, why I switched to inlines decades ago . Pancakes just ain't my thang. Don't have my hopes up for this one. Pretty sure I'll only have 1 for each class entered. P.S. I sincerely hope no one misunderstands my comment and thinks I'm launching a war on which is better. Was not the intent nor the meaning. There is no doubt that inlines are the superior type chassis. We still race the pancakes as everything is equal when the rules for the chassis etc. are the same. I can make a pancake pretty competitive with an inline with the same ohm armature but when it comes down to it the extra gears simply slow the cars down, physics means that it has to be so. I raced one of the stock pancake cars that I am sending to NZ against a new Mega G+ stocker and the old stock pancake 14 ohm car beat the stock inline 6 ohm car by a lot. Those stock times I recorded were after a lot of tinkering, going SLOWER some times, and also having the equipment to check all this stuff out. They still do things I cannot figure out like why one will out 60' the other despite every thing being the same or why one out MPH the other??? I have also been fooling with these things since I was knee high to a grasshopper and I have destroyed quite a few of them. FYI.......you guys may know this, but I wanted to make sure. Kiwidave runs NFC at 18v. Pancakes vs Inlines....I like them both, but I love my pancakes. I think the biggest enemy on them is friction and vibration. Got to pay attention to ALL of the friction points...armature hole is a forgotten one alot of times. Sometimes things can be so loose that they have a vibration at certain RPM's. Out of round/balance wheels HUGE! Clean electrical path from the rail to the comm....whatever that takes. Pick up shoe adjustment HUGE AGAIN! Of course you do have to have decent parts. There are a lot of different ways to get there, but the idea of low friction and clean electrical path seem easy enough. We all know that is not the case. They've made me scream and cuss out loud many many times. Gotta love it! Thanks everyone for allowing me to vent a little about my slow progress with pancake tuning. Last night; adjusted shoes a little differently on AW 4G and picked up .2+. Will be trying some other things as the time to ship draws closer. Thanks Dave & Jeff for the encouragement! Kiwidave, please put me down for 1 NFC entry and 1 Street entry. Thank You! My 4 cars are shipping out today. Dave no wheelie bars in street.